I have not used my blog to document special memories lately, but that is changing today! I do enjoy writing blog posts about fashion and sales, but my favorite blog posts are real life posts that I can look back on and remember all of the details from the time I got to spend with my favorite people. The title of this post says Round 2 in it because this was my family's second time to visit us in Southaven. I documented their first visit here- Wilson Weekend in Southaven. Looking back on that post, I did a much better job of taking pictures then. Whoopsies. I do not have nearly as many pictures, but I am happy to share what I've got today! My mom, dad, Ebie, and Patrick got to Southaven around 4:30. Just in time for cocktail hour. One of my favorite things to do is celebrate special occasions. Because I will not be with my dad on Father's Day, we celebrated him a little early. My family loves to see the clock when it says 4:44. 4 is our lucky number. We just so happened to say Cheers with our first beer at 4:44- a sign that we would have the BEST early Father's Day weekend together! We enjoyed our beer and app (cowboy caviar) while catching up, and then I showed Patrick around our house. It was his first time visiting us in Southaven. My mom and Ebie joined too. Seeing the mancave is always an interesting experience. Next up was dinner. Our weekend basically revolved around eating. We considered going out to our favorite Mexican restaurant in town- Rancho Grande. However, we ended up getting Salsaritas take out, so we could hang out with the pups at home. After dinner, we did our little Father's Day celebration. I'm so mad I don't have pictures of my dad's treats. If you know him, you know he is not a present lover. So we kept things pretty minimal. We gave him a fun card with a golf game on the front where you had to get the little metal ball into the hole. That was fun for everyone, and on the inside was an official signed document from Ebie and me promising no texting and driving for the year (this is the only gift my dad asks for every year). Ebie's signature was a source of entertainment- it looked something like Elsaba Fosal. Next up, my dad opened up his gifts- some books that my mom so kindly helped us with. My dad is quite possibly the hardest person in the world to buy gifts for, including books because he has read so many. We got him quite a few new ones that he will hopefully enjoy. I also made a brownie/cookie dessert. I took a picture of the box but not the actual product. Ughhhh- serious fail, but it's safe to say that everyone enjoyed it! We also got him 2 bundtlets (mini bundt cakes) from Nothing Bundt Cakes that we saved for the next night. I did get one good photo from Friday. Rosie adored my mom the entire time she was here. She rarely left her side. The precious little sleepy pup even decided at one point that she would jump up on the back of the couch and use my mom's head as a pillow. They both fell asleep in this position, and I thought my heart might explode. It takes a little less than 6 hours to get to Southaven from Mobile, and road tripping will wear ya out. Parker and I typically go to bed early anyway, so we were all in bed by 9:00. Had to get our beauty rest before a fun touristy day in Memphis the next day! We watched the French Open women's finals on Saturday morning, and I made pancakes- Ebie's favorite. Then we went on a short walk with the pups before a longer walk around Southaven suburbia. Next up, we all showered and got ready for a barbecue feast in Memphis. There's always a long line, but it moves pretty quickly. We got someone to take our pic while we were in line, and then I made sure to take a picture of all of our plates. Every single one of us cleared our plates. 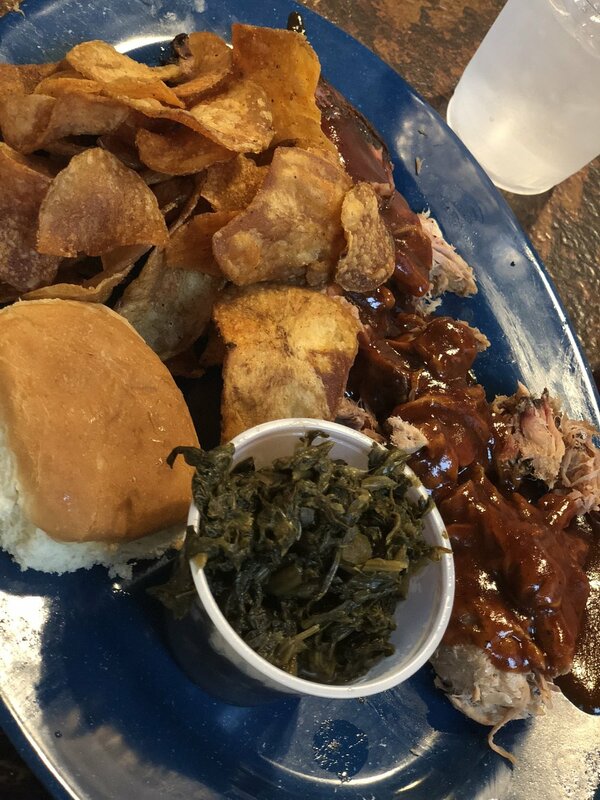 If you're ever looking for good barbecue in Memphis, Central BBQ is a must! Next up, we tried to be tourists in Memphis. The Lorraine Motel is right across from Central BBQ, so we walked over there and checked it out. Then we drove past Beale Street and headed on down to the Mississippi River. We finally got some pics here! Parker and I were not the best hosts because we honestly didn't really know where else to take my fam in Memphis, so we headed back to Southaven next. We were all exhausted by the time we got back, so we took naps. Welcome to vacay with the Goodmans- eat, sleep, repeat. :) We had planned on grilling out for dinner, but after the enormous feast we had for lunch, nobody was really hungry. So we got some yogurt at TCBY and called it a night! Actually after the TCBY, we busted into the bundlets. We went with confetti cake and praline pecan- both were delicious! We woke up Sunday morning and watched the French Open men's finals before heading out on a walk. Then we cooked the meal we had planned on making the night before- hamburgers, french fries, and baked beans. Such a delicious lunch before my family had to hit the road. It's never fun saying goodbye, but it wasn't too bad this time because we will see them again at the beach for the 4th of July! On Friday, my dad pointed out that he had never seen me put my phone down for so long. This comment really hit me. It is so rare that I am not on my phone, but it is so important to put it down and fully enjoy time with loved ones. I may not have the best picture proof of the fabulous weekend we had (because my phone was missing for part of the weekend), but I sure do have the memories of the special time we had together! I'm excited to incorporate more lifestyle posts into my blog in the coming weeks and months. But as always- I will link up outfit details for those people here for the fashion. :) Thanks so much for reading! Have a great day!